It’s late August and for most of the country summer is winding down however, as we Southern California residents know, the hottest days of the year lie just ahead of us in September through mid-October. Thanks to the famed Southern California sunshine, the area is host to many outdoor weddings held at beaches, parks, backyards and other open air venues. Outdoor weddings are beautiful but present a unique problem; how to protect the bridal party and guests from the harmful rays of the sun. 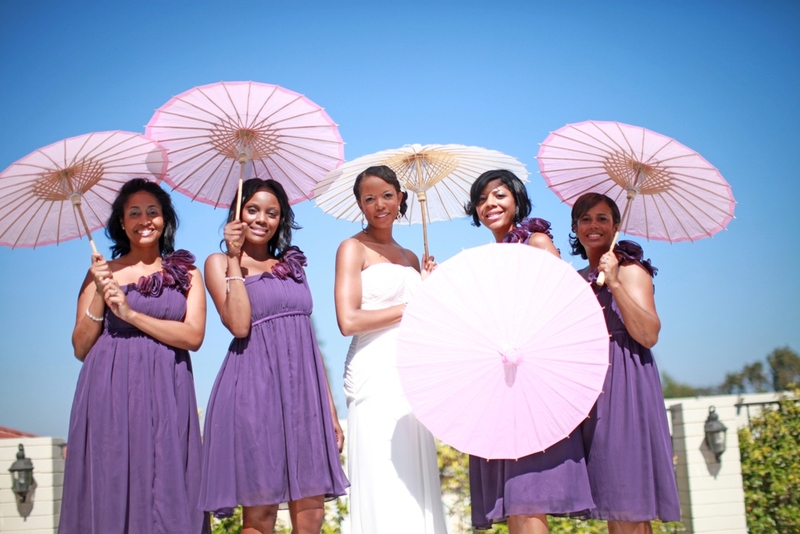 Wedding parasols and umbrellas provide a practical, inexpensive and colorful way to achieve this goal. Parasols made of paper or lace provide an excellent form of sun protection and can save brides and attendants from squinting during those all important wedding photos. Umbrellas, on the other hand, not only provide sun protection but also provide cover if your outdoor wedding is hit by an unexpected rain shower. Protection against the elements is not the only reason to use wedding parasols and wedding umbrellas in your ceremony. Most cost less than floral bouquets and thus make a practical, cost effective, long-lasting alternative to bridesmaid’s bouquets. They can also be monogrammed and passed out as keepsake wedding favors. Lastly, they provide beautiful photo props as demonstrated by my June 25th bride, Latasha, and her attendants. Photo courtesy of Third Eye Open Photography.